William Powell Frith (1819-1909) – his Road to Ruin series (1877-8) of 5 paintings and prints, and his The Race for Wealth series (1877-80) of 5 paintings and prints. George Morland was a painter with a life as colourful and rich in lessons about morality as any of these narrative series. His Laetitia series of about 1786 apparently used his wife as a model, and was summarised by Meisel as being a genteel version of Hogarth’s A Harlot’s Progress with a more forgiving ending. I have been unable to trace any images of the paintings, or the prints derived from them. James Northcote‘s long series Diligence and Dissipation is described by Meisel as being “a synthesis of Industry and Idleness, A Harlot’s Progress, and Richardson’s novel Pamela”, which traces the careers of a modest girl and more wanton fellow servants in a gentleman’s house. Again, I have been unable to trace any images of the paintings or prints. William Etty‘s triptych of paintings showing Judith and Holofernes, known in Farr’s catalogue raisonné simply as Judith, survives, but is in a very poorly state now, due to his extensive use of bitumen. The left wing shows Judith’s maid waiting outside Holofernes’ tent; the central canvas shows Judith taking hold of the hair of Holofernes’ head ready to decapitate him; the right wing shows Judith giving her maid the head to put in a meat bag. Hopefully these will undergo the necessary conservation treatment to recover their original appearance. Augustus Egg‘s series Past and Present has thankfully received the care of the Tate Gallery, and is thus the most accessible of these series. It is also the least conventional, and does not follow Hogarth’s approach. As Meisel points out, the three paintings are not intended to be a sequence of three scenes: instead the first is the first scene, and the other two are later scenes which are simultaneous with one another. The first shows an ordinary middle-class drawing room, in which there are mother, father, and two young daughters, each well-dressed. Most striking is the mother, who is stretched out across the green carpet, prone. Her arms are stretched beyond her head, which is buried face down between her upper arms, and the hands are clasped together in tension. The father is sat at a substantial circular table, facing the viewer. He is staring, brow furrowed, looking extremely tense and worried. His left hand holds a small note; his right hand is clenched, and rests on the table. His left shoe presses a miniature painting into the carpet. The daughters are playing together at the left, opposite their father. One kneeling, the other sat, on the carpet, they are building a house of cards, which appears to be just about to fall. One stares, her mouth slightly open in anxious surprise, looking towards where her mother might have been standing before she fell to the floor. The other girl is still looking intently at the house of cards. As with Hogarth’s narrative series, the room is full of cues, clues, and symbols to the narrative. 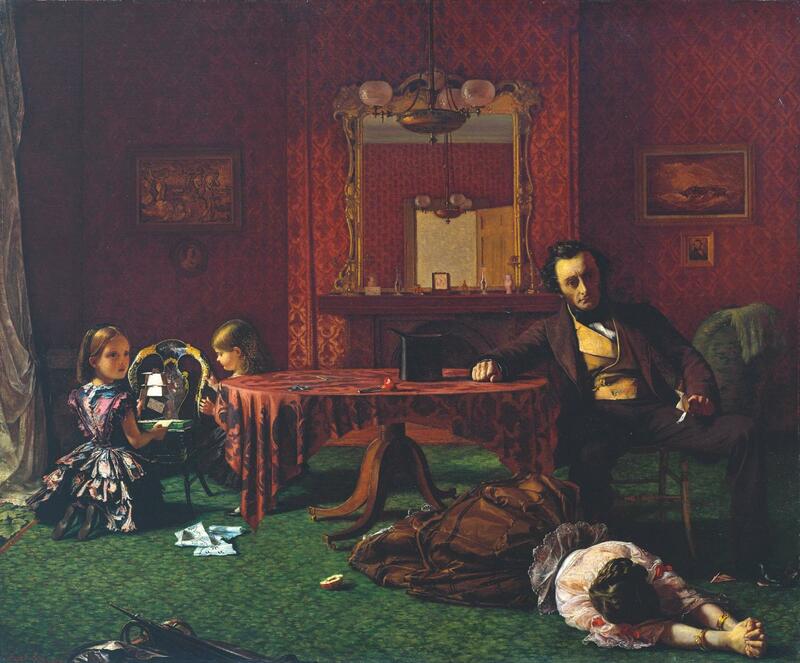 Among the more visible are: the collapsing house of cards; an apple has been cut in two, one half left on the table, the other on the carpet by the mother; the reflection of an open door indicating the imminent departure of the mother. Egg also uses Hogarth’s technique of paintings within the painting. On the wall at the left is the expulsion of Adam and Eve titled The Fall, below which is a miniature portrait of the mother; at the right is a shipwreck by Clarkson Stanfield titled Abandoned, below which is a miniature portrait of the father. August the 4th. Have just heard that B______ has been dead more than a fortnight, so his poor children have now lost both parents. I hear she was seen on Friday last near the Strand, evidently without a place to lay her head. What a fall hers has been! The clear implicit narrative is that the mother was in an adulterous relationship, which was revealed to the father in this moment of peripeteia. The other two paintings show the consequences. The two daughters are shown significantly older now. 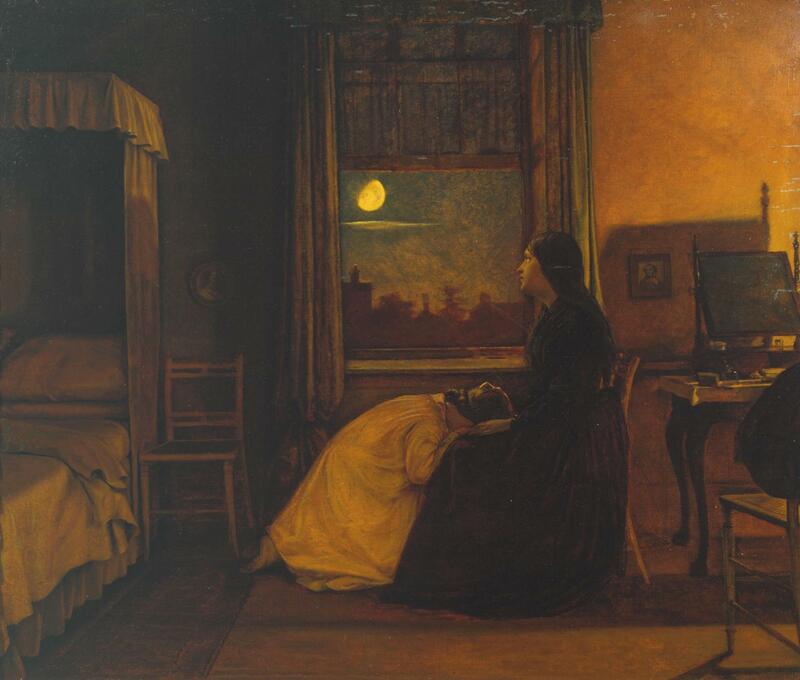 The senior is sat, staring vacantly out of the open window at a three-quarter full moon, while her younger sister buries her face between the older’s knees, kneeling partly in prayer, and partly in grief. On the wall, separated by the window, are the miniature portraits of their parents. The sparsely-furnished room, with bare floorboards, indicates their fall into relative poverty. Meanwhile the mother is homeless, sat among the debris under the arches of one of London’s bridges. She stares wide-eyed and fearful at a star in the sky, cradling a young baby to her, under her thin cloak. Behind her, on the side of the arch, are old posters, one with the word VICTIMS prominent, another advertising excursions to Paris. Although Egg’s departure from simple sequential narrative is innovative, and perhaps influenced by other narrative media at the time, he uses the same tools and techniques as did Hogarth, to good effect. Because the three paintings were (and remain) viewed together, we can enjoy his experiment with non-serial storytelling, a strength peculiar to narrative painting. William Frith, whose more famous panoramas I considered here, painted two narrative series, both of which were turned into prints. Even now, critical opinion of these series is divided, but the difficulty in seeing those paintings individually, let alone as complete series, makes it impossible to form a reliable view. The Road to Ruin series was first shown at the Royal Academy in 1878. Meisel (1983) shows Leopold Flameng’s 1878 etchings of the series, but the reproductions in the current reprint are too poor to make out much detail in them. Christopher Wood’s books (e.g. 1976) contain monochrome illustrations of the paintings, but I have yet to see good, large colour images of any of them. As far as I can tell, they remain in a private collection. The first, shows the hero at College, playing cards all night with his circle of friends in a college room. The second shows him at Ascot, placing bets on the horse-racing there, and well on his way to ruin. The third shows him at the moment of Arrest by a bailiff, when in a gambler’s house. The fourth shows his Struggles, after he has fled to France, where he tries to write a play whilst his wife paints watercolours to try to pay for their accommodation. The fifth shows The End, with him locking the door of a poor room, his play rejected, and about to blow his brains out with a pistol. Frith’s pictorial account of the downfall of an addicted gambler is well executed, and thoroughly in accordance with the tradition of Alberti and Hogarth. It lacks the latter’s brilliant satire, and his use of paintings within paintings. Its prints apparently sold very well. 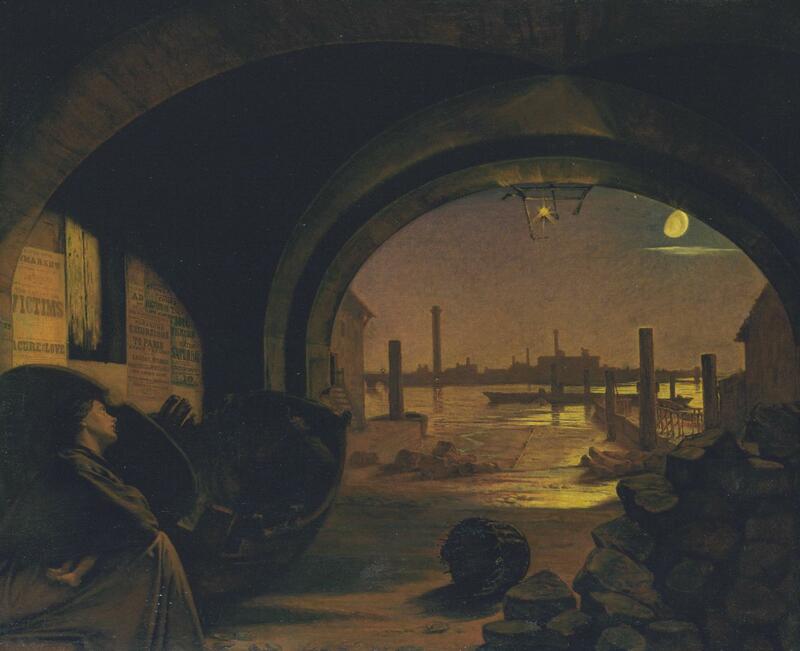 The Race for Wealth series was first exhibited in 1880, and attracted much attention. Unfortunately its prints were produced using photogravure, and Frith considered them “far from satisfactory”. He did not attempt another narrative series. The paintings ended up in the Baroda Museum and Picture Galleries in India, apparently modelled on the more famous museums in South Kensington, London. Not only has one departed for Birmingham, England, but the remaining four do not appear to be viewable on the Internet. Their story centres on a corrupt financier, the Spider. In the first, The Spider and the Flies, he is persuading prospective investors in an office in the City of London. In the second, The Spider at Home, he is entertaining in his drawing room, which is lavishly decorated with paintings (which sadly seem to lack Hogarth’s narrative cues). The third, Victims, shows one of the investors from the first canvas, a clergyman, devastated at his family breakfast when he learns that the company in which they invested their savings has suddenly collapsed. The fourth, Judgement, shows the Spider’s trial for fraud at the Old Bailey, with the ruined clergyman giving evidence. William Powell Frith (1819-1909), Retribution (The Race for Wealth, 5) (1880), oil on panel, 32.7 x 41.2 cm, Birmingham Museums and Art Gallery, Birmingham, England. The Athenaeum. 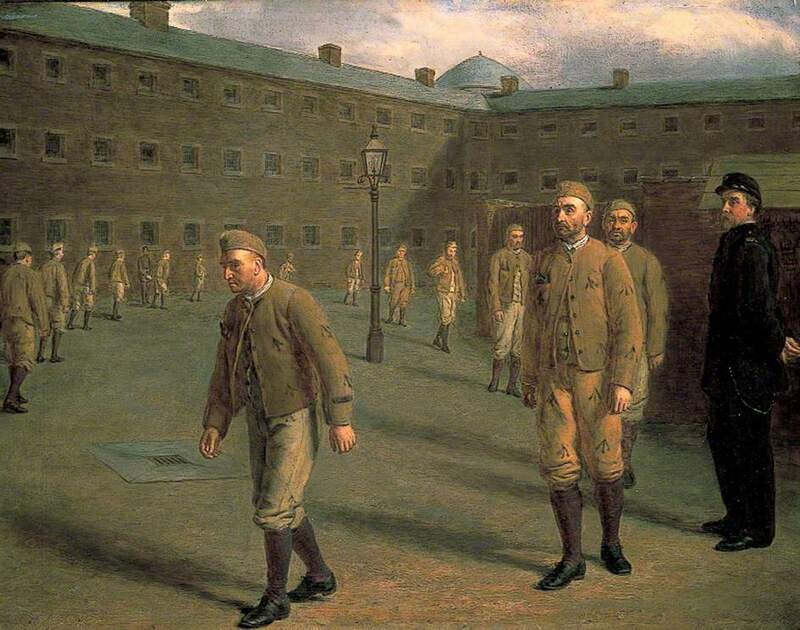 The fifth and last, Retribution, shows the Spider exercising in the yard of Millbank Prison, during his imprisonment for fraud. This is also one of only two images of the inside of a Victorian prison. The other, according to Christopher Wood, is an illustration by Gustave Doré. Attempts to repeat Hogarth’s success with narrative series of paintings were far from failures, but showed how much had depended on his sharp satire, and ingenious touches, particularly the use of paintings within paintings. Frith came to series late in his career, when he had tired of panoramas, at a time when huge changes were taking place in painting, with the arrival of Impressionism. Had the prints from his second series not been so disappointing, they would probably not have affected the sharp fall in his market value in the mid 1890s. Britain in Victorian times loved a good serial: it was the publication of Dickens’ novels in serial form which first brought him popularity and commercial success. It is therefore surprising that there were not many more attempts at narrative series of paintings. The Victorians also had a great affection for stories of morality, which were the basis for all these series of paintings. It is consistent with contemporary morals that Frith kept a mistress, who lived just down the road, and bore him seven of his total of nineteen children, and that Morland’s life would have made several enthralling moral tales. It is a crying shame that we are not able to enjoy any of these series now, except for that of Augustus Egg in the Tate Gallery. Those who are privileged enough to own paintings should treat them as works of art, and not just movable property. Farr DLA (1958) William Etty, Routledge & Kegan Paul. No ISBN. Wood C (1976) Victorian Panorama, Paintings of Victorian Life, Faber and Faber. ISBN 0 571 10780 X. Posted in General, Painting and tagged Egg, Etty, Frith, Hogarth, morality, Morland, narrative, Northcote, painting, series, Victorians. Bookmark the permalink.